Summary: Ss Joachim and Ann, Parents of Our Lady. Joachim and Ann are named as Mary’s parents in a late second century tradition. Churches dedicated to Saint Ann are found in Jerusalem and Constantinople from the middle of the sixth century. The feast of Saint Ann was kept in Rome by the eighth century, that of Saint Joachim from the fifteenth century. The feast honours the parents of the Virgin Mary and grandparents of the Lord. Historically, there has been some hesitancy on the part of the official Church to authorise a feast of the parents of the Blessed Virgin Mary, but eventually in the reform of the General Roman Calendar of 1969, it did. Patrick Duffy looks at the background to this feast. Neither Joachim nor Anne is mentioned in Scripture. The 2nd century non-canonical Gospel of James (the author presents himself as a son of Joseph from a previous marriage, and so a stepbrother of Jesus) tells the story of the birth of Mary in a way that has some resemblances with the story of the birth of Samuel (1 Kings 1), whose mother Hannah had also been childless. According to this story, Anne and her husband Joachim, after years of childlessness, were visited by an angel who told them that they would conceive a child. Anne promises to dedicate the child to God’s service. Devotion to St Anne is evidenced from the fact that at Constantinople in the middle of the sixth century the Emperor Justinian I dedicated a church to her and relics were taken from it to Jerusalem and Rome where there are pictures of St Anne at S. Maria Antiqua (8th century). In the Eastern Orthodox tradition, both the feasts of the Birth of Mary (8th September) and the Presentation of Mary in the Temple (21st November) are celebrated as two of the Twelve Great Feasts in the Orthodox tradition and are also celebrated today in the Liturgical Calendar of the Roman Rite. The Roman Church has had some hesitancy in giving official recognition to a feast of St Joachim (authorised by Julius II, suppressed by Pius V , restored by Gregory XV). 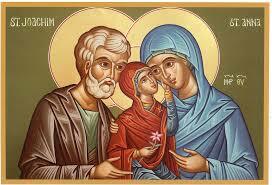 The joint feast of Saints Joachim and Anne was recognised by the General Roman Calendar 1969 which contains only those celebrations that are intended to be observed in the Roman Rite in every country of the world. 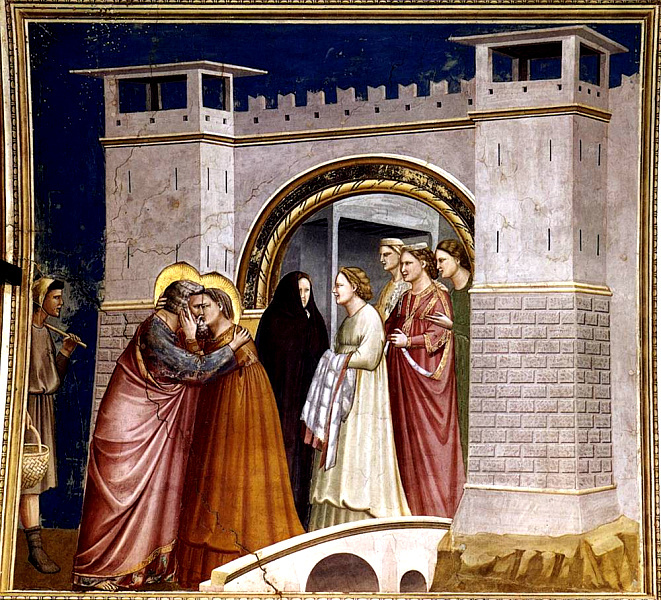 One of the most famous paintings of late medieval painter Giotto di Bondone (1267-1337) depicts the meeting of Joachim and Anna at the Golden Gate.